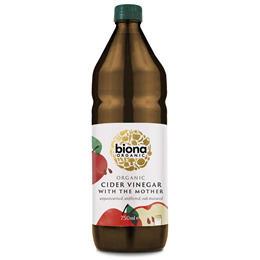 Biona`s Organic Cider Vinegar is made from fresh, cold cold pressed organic apple juice. To protect the valuable enzymes, aroma and fruit flavour, their vinegar is not heat treated or pasteurised and is aged in wooden casks. This organic, unfiltered apple cider vinegar contains `mother`, strands of proteins, enzymes and friendly bacteria that give the product a murky, cobweb-like appearance. Any natural cloudiness or sediments do not affect the quality of this product. Suitable for salad dressings and sauces. Suitable for salad dressings and sauces. For an invigorating tonic, mix 2-3 tablespoons of cider vinegar with honey in a glass of water. Bon Appetit! 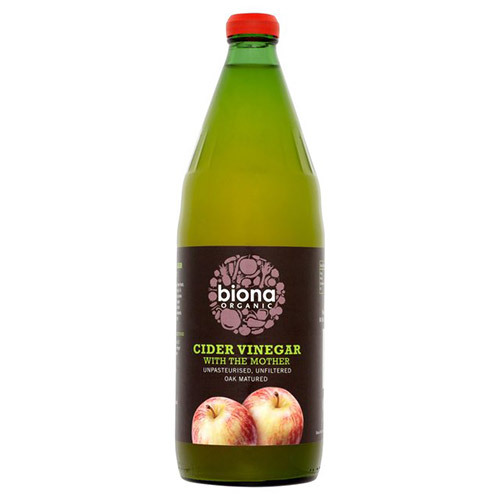 Below are reviews of Biona Organic Cider Vinegar - With the Mother - 750ml by bodykind customers. If you have tried this product we'd love to hear what you think so please leave a review. Great price for a good size bottle. Taste is good for an apple cider vinegar. Always been happy with this product and brand. Great tasting account. Great value too. Well packaged and arrived on time I drink this for health and well-being and the price is just perfect. Really great quality! Nice and tasty organic vinegar, matured in oak casks! Highly recommended. Enjoyed in the morning as a refreshing warm drink with a little honey. So good! Fantastic! Cider vinegar is so good for you and it’s an added bonus that it’s organic and unpasteurised.